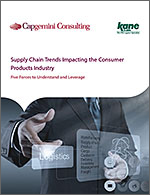 KANE recently collaborated with Capgemini Consulting to co-write a paper on Supply Chain Trends Impacting the Consumer Products Industry. Capgemini is well known for its work with the Consumer Goods Forum and others to map out how future value chains for consumer goods must work to be most effective. The KANE/Capgemini paper addresses 5 trends that will shape consumer goods supply chains going forward. Here's a quick summary. Big Data. Most agree that future supply chain efficiency will result from greater and greater degrees of collaboration, both within and across enterprises. That means increased sharing of data and the ability to analyze that data to drive decisions. However, the focus for many shippers is on silo data, which points to the need for analytical tools that drive impactful cost/benefit solutions. Part of the problem is that reward systems are silo-based. The distribution director whose bonus is based on reducing warehousing costs is unlikely to add a location to his network if it also adds $1 million in inventory, facility, and handling costs – even if the strategy reduces transportation costs by $2 million. All-Channel Fulfillment. All-Channel Fulfillment optimizes the supply chain's capabilities to simultaneously receive and process orders from multiple ordering channels and fulfill them from the source that provides a high level of consumer satisfaction and lowest cost to the seller. Implementing a successful solution requires optimizing inventory across the entire supply chain (vendors, distribution centers, and retail stores) in order to reduce lost sales due to stock outs, while also positioning inventory correctly to provide the lowest possible fulfillment warehousing cost. Achieving this optimization requires a set of systems working in concert, from inventory and planning to order management and through to supply chain execution. Most consumer product vendors are struggling to achieve this level of systems harmony. Sustainability. Several years ago, the idea of companies measuring and managing their impact on social and environmental issues was not a priority. But today attention to these topics, as well as related issues such as using reusable and recyclable material to reduce waste, is rising rapidly. Sustainability is a critical component of a supply chain strategy because it aligns economic, social, and environmental interests. Companies have shown that there is a connection between sustainability and financial gains, such as when like companies (even competitors!) co-locate inventory and co-load freight in a collaboration distribution arrangement. Social Media. Nurturing new relationships both inside and outside an organization through social networking has the potential to improve processes, extend communications, and create business innovation. Manufacturers across the U.S. are using social media to improve communications throughout their organizations. Employees are able to send immediate messages and photos whenever there is an issue within operations. This has resulted in a 20% improvement in production for some companies that utilize social media to communicate. Changing Third-Party Logistics Business Models. Third party logistics providers (3PLs) have served consumer goods companies for decades, primarily as tactical partners in warehousing and delivery. But the strategic role of 3PLs is changing as they expand capabilities and position themselves upstream and downstream in the supply chain. 3PLs have not only expanded capabilities, their investments in engineering, supply chain software, and information systems infrastructure often dwarf those of their customers in the consumer goods space. Sophisticated, full-service 3PLs provide an interesting option to the logistics organizations of consumer goods companies that want to adapt quickly and decisively to market changes. The question is how to leverage these capabilities to the fullest and forge more strategic partnerships with 3PLs.